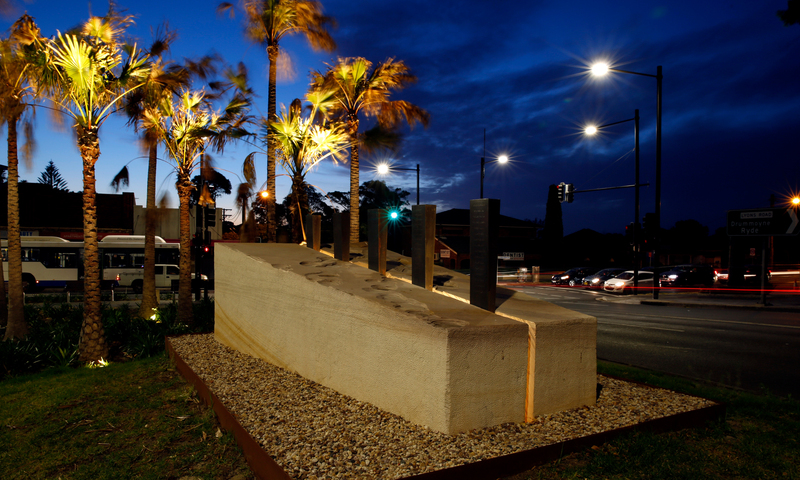 A permanent public artwork commemorating the building of the Great North Road, a major early colonial infrastructure project in Sydney. The work consist of a monolithic block of Sydney sandstone split by a series of five engraved bronze wedges. Etched into each of the bronze wedges are the names of convict Road Party 14 who were the closest documented working party to Five Dock. The top surface of the sandstone features a series of incised contours and circular depressions which are reminiscent of both human mark-making and natural weathering processes. For this commission we aimed to create a permanent contemporary public artwork commemorating the building of the Great North Road and recognizing the efforts of the convict laborers involved. It also seeks to evoke the human dimension of an important achievement in early Australian infrastructure by placing the ‘nameless’ convicts at the heart of the work. The work reflects the physical challenges faced by those who carved the road through solid sandstone and dense bushland using only hand tools. It also seeks to reclaim the identities of some of the many hundreds of ‘nameless’ convict laborers responsible. The title, Reformers, references the era’s belief in the ‘reforming’ powers of hard physical labour. In the sense of ‘re-forming’ or changing, it also touches on the impacts on cultures and landscape of early 19th century Australia to which such colonial projects contributed. Project partners included Historian Elizabeth Roberts who provided the list of names for Road Party 14, Damian Hadley Structural Engineer, Cantilever, Sandstone quarrying, transport and shaping Andrew McGahey, Total Earth Care, Lighting Designer Frederika Perry, Illuminated Design. The City of Canada Bay Council commissioned this artwork in consultation with the community of Five Dock.